Explore Los Angeles from this downtown hotel located in the heart of L.A. Live. The well-appointed and tech-savvy guest rooms deliver a sound night's sleep after an exciting day in the city. By day, the casual Bistro serves healthy breakfast options, and by night, an array of custom cocktails complement a menu of hearty meals. Maintain your fitness routine at the fitness center and outdoor pool. 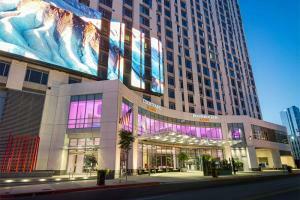 LA's most popular downtown attractions are within walking distance from this hotel.